Have you ever wanted that physical, emotional, or mental edge on your competition? Did you ever think there was something you should be doing to gain that advantage in life? How could you approach work, school, sport, or parenting from a different angle? Do you have trouble adapting to change? 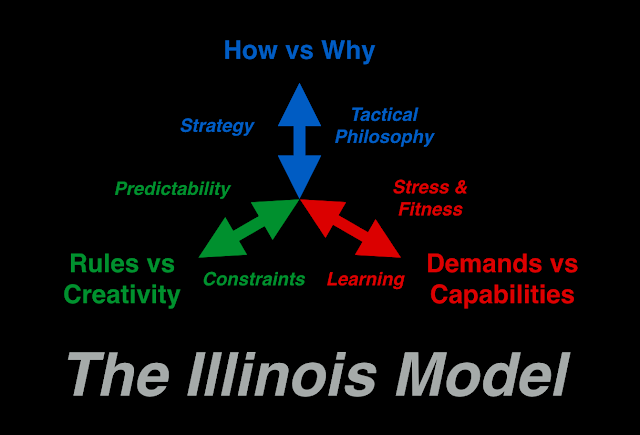 The Illinois Model is an adaptive operational tool, an organizational design template, and a human development/education framework -- for learning to thrive in complexity, uncertainty, and in dynamic high-stakes challenges. My name is Lou Hayes, Jr. In 1998, I dropped out of college to become a police officer in the Chicago area. My journey has led me to positions as a bicycle cop, a training partner, an instructor, a SWAT door-kicker, a policy geek, a crisis interventionist, a Detective, a weapons armorer, a Sergeant, a rangemaster, a training unit coordinator, and a lot of other cool gigs inside and outside the police department. I am still a full-time cop...doing this stuff as my side hustle. In around 2006, I gathered a small group of police SWAT officers to design a tactical problem-solving process. As the training system grew in popularity, it became known as The Illinois Model. It was a radical departure from how police officers were being trained…and just as unique to how they made decisions in the field. As such, traditionalists asked questions about how and why it worked. I didn’t quite know myself. So I began to study more deeply into how humans processed information, responded to change, and ultimately made decisions. In 2013, I published The Doctor in SWAT School (and What His Performance Says About Police Culture), a blog post describing a true story about adaptive problem-solving. The response from those outside law enforcement was amazingly positive. I suspected The Illinois Model’s underlying theories were limitless in application. The Model is receiving interest from the education sector, the military, systems designers, the health care industry, information management folks, and of course…public safety. STRESS. The Stress axis (or Fitness axis) balances system capabilities anddemands. It accounts for emotion, time, resources, fragility, knowledge, resiliency, and mental bandwidth. Stress is a mixture of mental, physical, and emotional limits. PREDICTABILITY. The Predictability axis (or Control axis) accounts for the known/reliable and the uncertain/chaotic. This includes the expectations and the functions within the system…the inputs and outputs. It balances Rules vs Creative environments and seeks to find a balance between the custom and the standardized. STRATEGY. The final axis is the Strategic dimension (or Tactical Philosophy). It accounts for and prioritizes the tensions between leadership & management, How & Why, concept & details, justification & method, and much more. 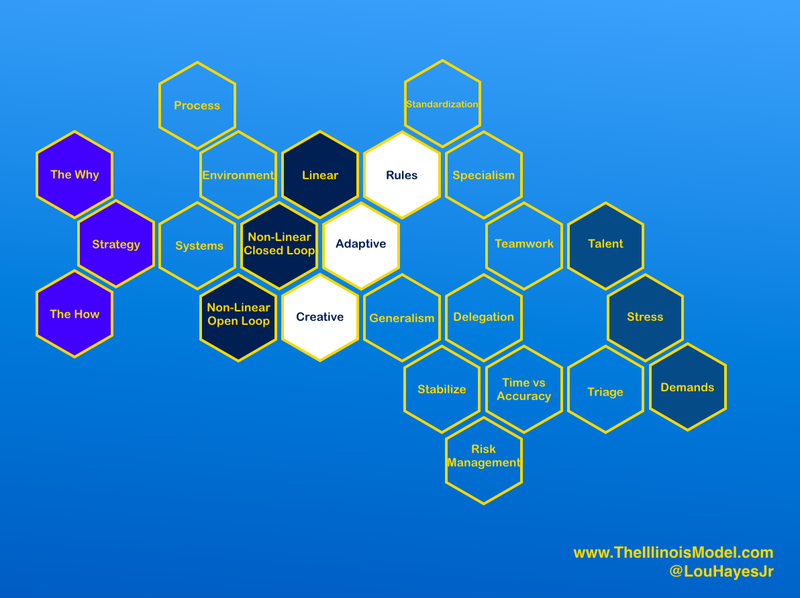 The Illinois Model has also been used to connect emotional intelligence, risk management, generalism & specialism, educational curriculum, supervision, and policy design. Special thanks go to a group of friends & influencers who have been alongside me on this journey: Tony Johnson, Danny Ramirez, Mike "Froggy" Clark, Brian Melvin, Brad Caliendo, Scott Naydenoff, Thom Dworak, Fred Leland, Patrick Van Horne, Joe Willis, Dave Snowden, The Virtus Group, the Illinois Tactical Officers Association (ITOA), and though I never met the man...the late Air Force Colonel John Boyd. These men have been vital to the perpetual refinement of The Illinois Model, each at various points in its existence. Will you join me on the next steps of the journey? Be sure to follow my thoughts on Twitter at @LouHayesJr and on LinkedIn. I also post a weekly reading & podcast list on Fridays called Weekend Building Blocks to share the five or so nuggets that I've found most valuable to help me grow my thinking. Lastly, I write posts on public speaking tricks called Presentation Hack, helping you improve your slides, presentations, storytelling, and more!